For Christmas, my brother and I got my dad the books to play 5th Ed D&D. We had been playing AD&D since my dad first got those books back when Christ was a cowboy. Right now we are in the middle of a dungeon that he is running with the old rules and wants to finish, but I offered him an idea that he was on board with. I told him that I would run the next campaign, and that we would change things up in that instead of having a party that is comprised of good and neutral characters, I wanted everyone to be evil. The biggest change would be getting him out of the DM seat and back into playing a character. Now, I know I can just go and buy a dungeon to run through for our first time with the new rules, but I want our campaign to be more than our usual of go into a dungeon, kill everything, win. So I started getting it into my head of starting a campaign that has some good RP elements while also giving some reasonable backing to get them into dungeons. What I was figuring to make it more compelling would be to stick with what I know, so it is going to be "set" in the Old World (I say "set" because my sister is adamantly against a setting change, but what she don't know won't hurt her). They are new hires to a mercenary company that operates out of the slums of Marienburg. Summoned to the city, they have to find their way to the company whose headquarters is just south of the Merchant District. There, they are given orders that they are to meet with a ship at the docks within 3 hours to leave on the tide, where they will be taken to a Bretonnian city along their coast called Mousillion to serve some lord or noble. When they reach Mousillion, they find that they are summoned before the Duke. The king was slain (with no heir) in repelling an Orc invasion from the mountains, and the duke figures that this is the best time for him to try and seize power. He believes that with the right heirloom, one that can be traced back to his ancestor who fought alongside the first king, he can come forward with a strong claim to the throne. But this artifact was lost centuries ago, and all that remain are stories about how it was lost in battle and that it is rumoured the elves had taken it. 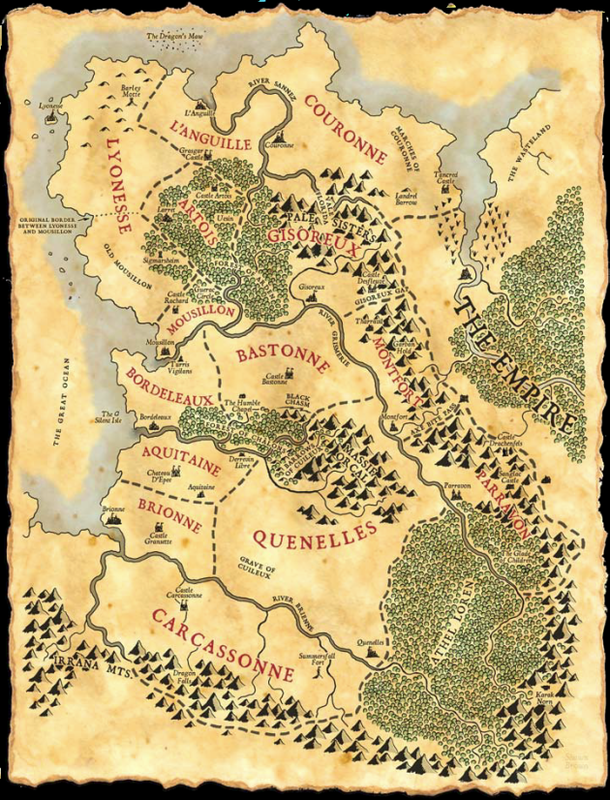 The only elven stronghold that he is aware of is in the Forest of Chalons to the South-East. They are to enter the woods, seek out the elves, and either retrieve the artifact or find information leading to its whereabouts. This will be the first dungeon that they must fight through. They would have to first infiltrate the woods, and then a Wood Elf city. At the end of the dungeon, they won't find the artifact, but they will find information saying that it was taken by their kin to the ancestral home of the elves to the west. This should lead them to attacking Ulthuan. I'm thinking at this point they charter a ship to search for Ulthuan, but encounter a Black Arc. Ultimately, the idea here would be to have the Dark Elves lead them to Nagarythe to show them where to land. Once they reach Ulthuan, they would have to find information on where the High Elves would keep the artifact. The potential for so many different experiences here are astronomical! Once they eventually find the artifact, they return to Mousillion and present it to the duke. I was thinking that at this point, it might be an interesting twist for them to find out that the artifact had no bearing on who became king, which would lead the Duke to enlisting their services as he goes to war. So that's the overall idea I have for the campaign, but I've always been the player, never the DM. I have noooooooo idea how to go about organizing or making it interesting for the players. The DM is not god and they are not the enemy--they are a facilitator to making a game fun, and the game can't be fun if they try and force everyone into a story they aren't engaged in. Keep in mind your fun matters, too--tell them what you want to try, see how they want to contribute, and keep it open and friendly. The game will VASTLY improve if this conversation is had BEFORE the campaign and not during. Beyond this, here are my 10 Commandments of Gamemastering, which you can take or leave (links to my blog). Making a campaign isn't easy, but you have the advantage of knowing the players So you know if you should lean more towards a diablo hack, loot, with a sprinkling of story or to go more story driven, more puzzle solving sort of campaign. Timed events can also be good, for example, you give the group a list of options and then given them a count down, they have to pick one before the times up. Very good for simulating pressure. Thanks for the advice. I'll definitely keep all of that in mind, and I'll probably be referring to your link a number of times, Wyddr. So, now I need to get into the nitty gritty. Putting pen to paper and actually writing out the campaign and planning out the details. Every good adventure needs a captivating introduction, and this is what I have written down so far to draw them into the game. Having completed your training, you struck out into the world in search of adventure and glory. However, it always felt as if the adventure you sought was just beyond your reach. Wandering from town to town, you started noticing postings for a mercenary company that was hiring anyone who was willing and able to fight. The notice directed you to make your way to the city of Marienburg and seek out a man named Rolf who could be found near the south gate at the changing of the third watch. Travelling for weeks, the rolling plains gradually change to feted wetlands. The hard packed, dusty roads giving way to squelching mud that you sink into with every step. The crisp, clean air slowly becomes tainted with the smells of the sea as you draw closer to the coast. Finally, after cresting a hill, you look down and see the sprawling port city before you. A massive wall surrounds the city, studded with guard towers and two massive gates dominating sections of the wall in the east and south. The city looks ancient and worn, with streets that seem to have no rhyme or reason as they wind chaotically between the buildings. As you approach the south gate, a group of city guards detach themselves from the wall as they recognize that there is something that sets you apart from the usual merchant traffic flowing through the gate. Spreading out to block the road, one who appears to be in charge steps forward, raises his hand, and firmly commands “Halt!” The people quickly move away from you, clearing the road between you and the guards, but their curiosity keeps them close. <If they answer that they are looking for Rolf, Guard says> - “Rolf?” The Guard laughs, and you notice someone’s head in the crowd snaps around to look at you. “Is that name supposed to mean something to me? We don’t want troublemakers in our city, and armed like that... you lot scream trouble. So, piss off.” The guards slowly make their ways back towards the gate, blocking your way and never taking their eyes off you. <If they mention that they are seeking employment with a mercenary company> "Mercenaries? Pah!" The guard spits on the ground, and you notice a man's head snap around to look at you. "No such company exists within these walls. Marienburg is renowned for its trade and merchants. Never would we allow such a disreputable organization, and if one did exist... rest assured that we would hunt them down without mercy. Last thing we need are hired thugs within our city, so piss off!" As the guards retake their positions, a bell tolls three times in the distance. Within a few moments, a column of troops can be seen approaching the gate. As the new guard takes up their positions, the crowd around you grows larger, with the majority of people passing through the gate with little to no questions being asked of them. The sergeants of the guard can be seen through the crowd talking, and there is no mistaking that the old guard searches through the crowd until he spots you, pointing you out specifically. I have included notes in the text for areas I'd like to discuss and get some ideas about. I am looking for some assistance on the overall, so if you have any suggestions on how to improve, then I am all ears. The inside of the tavern is poorly lit, the majority of the light filling the room coming from a dim fire on the wall to your left. Several of the tables are occupied by leather clad men huddled in quiet conversation; the glint of weapons concealed can be seen in the firelight. At the bar stands a pair of men, one keeps a wary eye on the common room and the other apparently engrossed in his drink. Pointing to a table in the back corner, you are told to sit and wait for the Grand Master before he disappears into the back room. 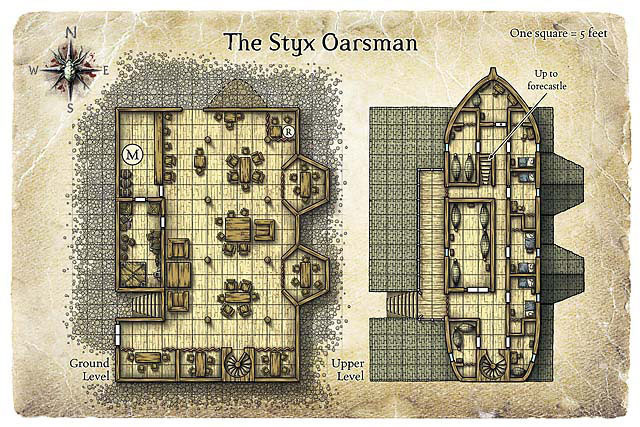 The door to the tavern slams open as a group of <# of characters + 2> humans walk in. Looking around, they seem to stare at your table as they walk through the room, occupying the table(s) nearest yours. They talk amongst themselves, but their eyes keep darting over to your table. <After answering questions...> “Alright, good. Oh, there is one more thing. My reputation is on the line based on your performance. It looks bad on me if my mercenaries get killed without getting the job done. So, there will be a significant bonus to your pay if you pull this off... provided every member of your group returns. If one of you does not make it back, then none of you will benefit. <*** Note 2> This is a significant investment for me. Any additional equipment you think you will need will be stored onboard the ship. I expect a return on my investment. Am I understood? Good. Ladies and Gentlemen, welcome to the Ironblades. Now, if I’m not mistaken, you have a ship to catch. Time and tide waits for no man!” He then disappears up the stairs at the back of the room. *** Note 1 - I have no idea how to go about picking a fight. I want something more than just that he walks up and starts swinging. So some dialogue perhaps, but I don't know what. *** Note 2 - I put this in because, as I mentioned before, my family will be playing evil characters for the first time. My sister has already expressed a desire to commence with the back stabbing, so I want to have an incentive to prevent that for as long as possible. I have never played a RPG before, so maybe I shouldn't be posting in here. I have just got to say I like what you have written so far. It is characterful and really sets the scene. Not being a role player I have got to say I am very much surprised by how little choice the players seem to have over their actions. By that I mean when they first approach the village their only choice is to walk up to the gates and get told to piss off. Can they not decide to send one person into the village 'incognito', or what about the old wait for a passing hay wagon to hide in. The other thing that surprised me was the if you don't do as I say you will all die stance of Ashington. The party has just beaten a large group of armed men, so what is to stop them attacking Ashington to beat the information out of him. Note 1: Would it be possible to have one of the group recognise one of the party from a past encounter that didn't end well for some reason. Maybe one of the party killed a best friend, or slept with a wife. A simpler option could be that one of the group could bump into the party on the way to their table and then something could be made of that. Overall, I like the set-up! I'll echo what Alienscar said, in that you are probably planning too much and constraining player choice too much for my tastes. Now I will say that it may well be that your family is accustomed to this kind of set-up (indeed, it isn't dissimilar to a lot of pre-written adventure modules you see around) and all is fine. You've made it as far as Marienburg without the bounty-hunters catching up to you, eating squirrels and drinking pond water for the last two weeks as you cut through dark forests and foundered in muddy swamps. You're filthy, you're broke, and you're desperate--no one is going to take a chance on a villain like you, and you know it. But you've heard of a chance: there's a band of mercenaries, run by some guy named Rolf. Get in the company, and you're safe--the bounty hunters wouldn't dare touch one of Rolf's men. Or at least that's what you've heard. That's what's on your mind as you approach the gates on that rainy afternoon: this. This is your last chance. The point here isn't the precise set-up, but giving the character immediate stakes--they need to join this company, because if they don't, it's a short drop and a short stop. The set-up you currently have doesn't have any real reason for the players to join the company outside of idle curiosity and nothing better to do (and that kind of semi-visible patina of "The DM Commandeth Thee!"). If *I* were playing an evil character (i.e. "selfish"), I can't say I'd be all that enthused to join this company without some good reason. Now, the reason needn't be the one I've offered. Indeed, I wouldn't even say that all the PCs need the same reason (you could customize a hook for each of them, depending on the characters they're playing), but I think you'll be massively better off giving them a real motivation to want to join the company. Now, once you've got a motivation in place, they are going to work harder to get into the city, they are going to be more emphatic about joining the company, and they're going to be more pissed off by the thugs trying to screw up their chances in the bar. You don't really need to script exactly what happens when players choose particular courses of action. The reason you don't is because players will often choose courses of action you didn't anticipate and then you're stuck with a dumb look on your face and no idea what to do. The guards won't let the PCs inside because they look like wanted criminals (which they are!). They will fight to prevent them from entering, but they can be bribed for (x). There are (y) guards in the gatehouse and the walls are (z) feet high. They have no interest in pursuing the PCs into the countryside, so if the PCs run away or just leave, they'll just sit there in their cozy guardhouse. The players can try and break into the city or, if they wait, a cloaked figure will guide them inside by bribing the guards. This allows the PCs several avenues of pursuing their goals (bribery, sneaking over the walls, battle) and, should they come up with something weird, you can easily extrapolate. Like, what happens if the bard seduces the watch sergeant? Can the wizard cast Sleep on the guys at the gate and they just slip by? Is there some kind of drainage ditch that comes out through the wall somewhere that they can slip in? Can they stow away in the wagon of some visiting peddler or merchant? To my mind, the answer to all of these questions should be "Sure, but..." and then you explain the obstacle they have to overcome to allow their plan to work. Same thing with the brutes in the tavern (oh, and as for Note 1, racism or sexism is always an easy incitement to violence. Just have them crack short jokes about the dwarf). Just set the stage and then let the Rule of Cool and the PCs' creativity do the rest. In a lot of cases they're just going to go breaking tankards over heads, anyway, but you never know, so it's good to be flexible. The way you temper flexibility is with motivation, which in turn drives them to overcome obstacles, which then can be used to segue into new motivations.